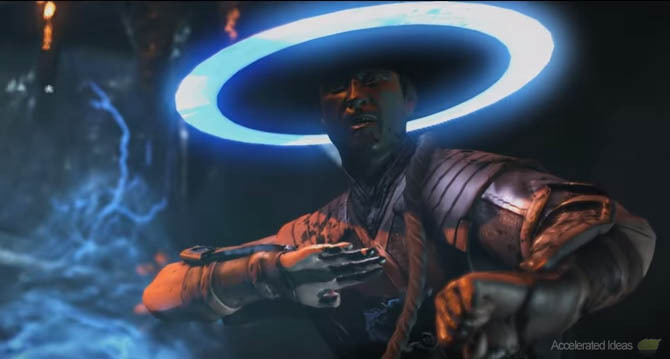 First introduced in MK2, Kung Lao is a Shaolin Monk fighter with a similar fighting style to Liu Kang in terms of agility and style, but his greatest asset is his deadly razor sharp hat - which is responsible for the majority of his special moves. This "magic"hat is almost supernatural in it's behaviour - returning automatically after being thrown across the screen. Kung Lao also has complete control over the hat, using it as a projectile as well as a close quarters melee weapon. 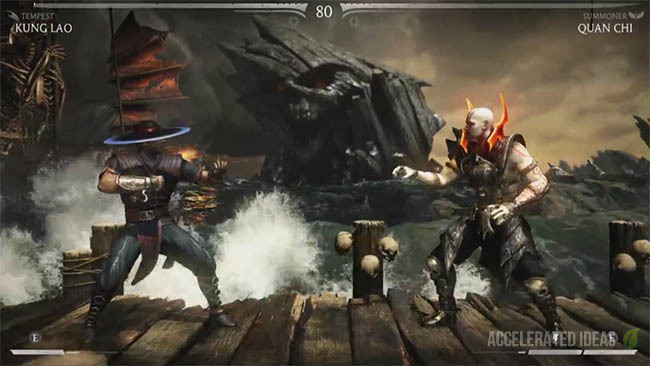 In Mortal Kombat 10, Kung Lao has the following variations: Tempest, Buzz Saw and Hat Trick. Across each of the variations the razor sharp hat is used in differing ways. First as a traditional hat projectile in Tempest. Then as a slow moving circular chainsaw in the Buzz Saw variation which is great for setting up attacks and finally as a stationary hat trap in the Hat Trick variation. Kung Lao performs a fast, downwards flying kick from midair. Instantly teleport behind the other player. Similar to Raidens move, Lao teleports from the ground up rather than dropping down from the sky. Gains a couple of new spin moves and the classic hat toss special move. 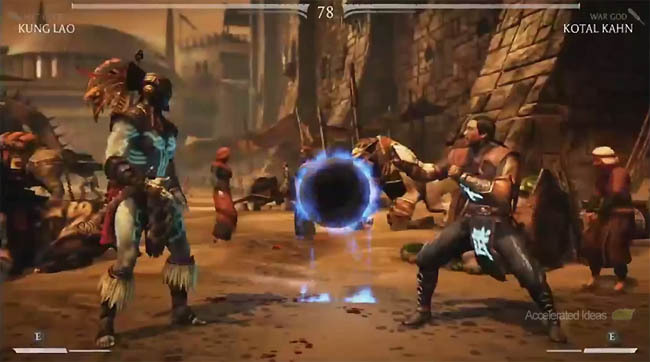 In this variation Lao has a glowing blue Lotus symbol on his back and you could consider this a classical Kung Lao class. It favours neither long range nor up close attacks, giving you the option to mix and match. Throws his hat like a projectile. It's a fast full screen projectile which can also be curved upwards and downwards. 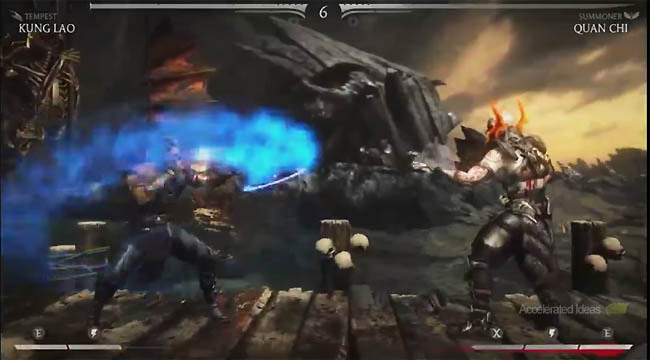 Lao spins quickly in a circle causing light damage to opponents that are within touching distance. The enhanced version covers a wider area and even drags the opponent in and lifts them up for a combo starter. Lao spins his hat around his body for several seconds. It provides automatic attack damage at close quarters and still allows you to move freely around the screen. The enhanced version causes the hat to sweep up and down, thus covering a wider area. 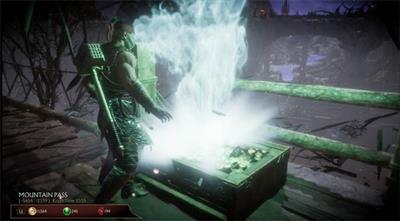 In this variation Kung Lao gains several hat grinder attacks and the trademark hat has serrated edges just like a chainsaw blade. This class focuses heavily on ranged attacks, with some great variations on high, mid and low projectiles enabling the player to zone out their opponent and force them into a box. A much slower hat toss that can be used for attack setups. The blade causes considerable damage on impact and it's speed is similar to Reptiles force ball. The hat is tossed at a 45 degree angle up into the air, perfect for catching an opponent attempting to jump in. Similar to the Hat Grinder move above, but this time the hat projectile hugs the ground instead. Gains recallable hat traps which can be strategically placed into the background and activated at a later time. This class favours expert players who understand how to force an opponents hand. Place a stationary hat into the background (that doesn't interfere with play). The hat can be recalled at any time causing guaranteed damage to the other player if they're between Lao and the hats position. The downside is that the hat disappears if you get hit and you also lose your projectile while the hats deployed in the background. Unlike other MKX characters, Kung Lao's throw is in fact a furious punching move, where he tilts the player over and punches them repeatedly. It's from this move that one of his best Brutalities originates. Initiating a throw move on someone with very low health will start the furious punch move but instead of dishing out only a handful of punches, Lao continues to punch until the opponents head pops. Available only in the Buzz Saw variation this Brutality move starts with a simple 45 degree hat throw. The hat then zigzags towards the opponents chest, slicing them vertically in two. This Brutality move is performed at long range. 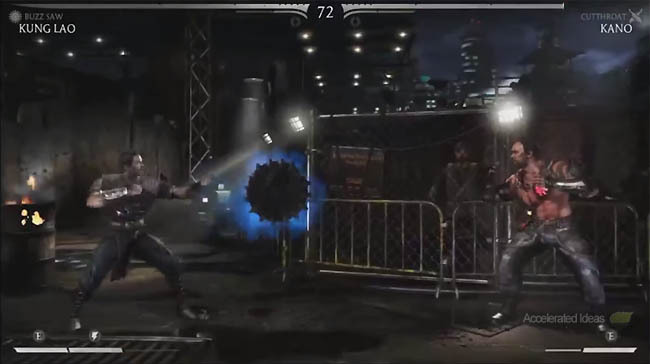 At sweep distance, Kung Lao throws his "chainsaw style" hat into the ground behind him - where it continuously spins on its own accord. He then grabs the opponent and forces their head into the spinning blade and the results are a spectacular mess! This Fatality is only available in the Buzz Variation.